Just a few years ago, the hottest new technology at CES was OLED TV. It started out with small displays, like a mobile phone or a car stereo, then expanded to full-sized televisions. 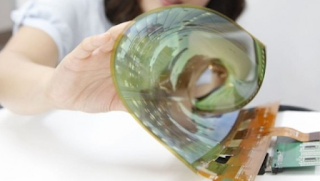 OLED was a big deal because it was so thin it could be adapted to almost any situation. Now Korean manufacturer LG is showing off the demonstration version of a video screen that is so thin and flexible it can be rolled up like a newspaper. Like the early OLED's, the LG prototype is small, just 18 inches wide, and it’s has a fairly low resolution at 1200 x 810pixels. The company did not announces details on pricing or when the technology will reach the consumer market. But an official told reporters that LG expects a 60-inch version to be available some time in 2017.